The police seized one Volvo car, a revolver, cash counting macines and mobile phones from the accused persons. Commissioner of Police Hyderabad Anjani Kumar addressing the media with seized money on Wednesday. 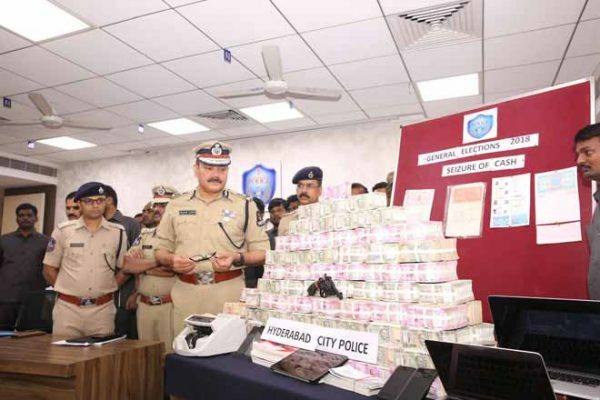 Hyderabad: A whopping amount of Rs 7.51 crore to be reportedly used for bribing the voters was seized from four hawala operators by the Commissioner’s Task Force (Central) team with the assistance of flying squad and Static Surveillance Team (SST) on Wednesday. The four persons caught along with the huge cash were identified as Ashish Kumar Ahuja, 23, of Naveennagar; Mohd Azam, 31,of Bahadurpura; Sunil Kumar Ahuja, 50, of Naveennagar and Bahbut Singh Raj Purohit, 46 of Ghoshamahal. According to the Commissioner of Police Hyderabad, Anjani Kumar, on a specific input the city police had planned the operation and caught the four persons at three different places. The police seized one Volvo car, a revolver, cash counting macines and mobile phones from the accused persons. Mr. Anjani Kumar said that the Hawala Operators were working and are planning to distribute crores of Rupees in Telangana. This money is coming from other States and abroad through Hawala channels illegally for use in forthcoming Legislative Assembly Elections – 2018 in Telangana. “The amounts have been transferred online into the accounts of Shell Companies of Hawala Operators. To facilitate this, Hawala Operators are falsifying documents, given false declarations to open such Bank accounts and thereby cheating the banks and the government, he said. He added that the money would have been used for bribing the voters involved in the election process. “The amount was meant to be delivered to some political leaders,” the Commissioner said. The police said that the 32NP bore revolver pertains to brother of Sumeet Singh. The case is being transferred to the Central Crime Station and will investigated further by an officials of ACP rank. The seizure details are being intimated to the Enforcement Directorate and the Income Tax Department so that they can examine the trail of financial transactions and involvement of Shell companies.